TORONTO -- Premier Doug Ford slammed his predecessor's handling of Ontario's books Monday, calling it the "biggest government scandal in a generation," as he announced plans for a special committee that would dig further into the province's fiscal situation. 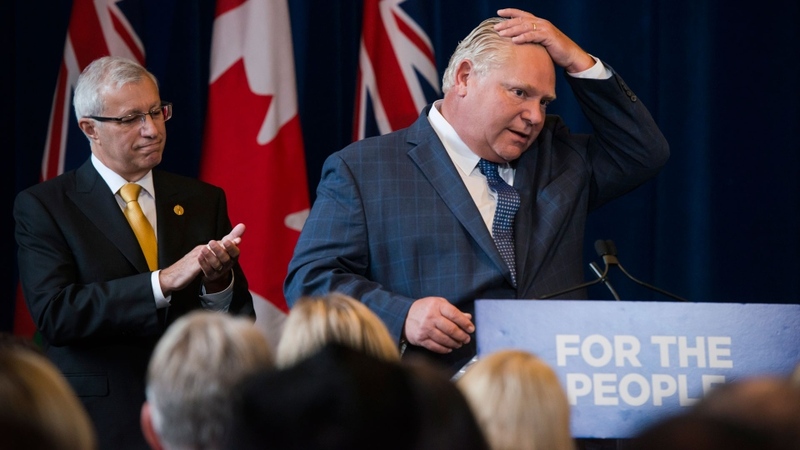 Ford's vow to hold the previous regime accountable came in a speech to caucus delivered days after his finance minister announced Ontario was dealing with a recently revised $15 billion deficit as a result of Liberal accounting practices. Critics said Ford's move would likely set the stage for cuts to services and expressed skepticism about the committee's work. The premier, however, said the work of the "select committee" was much needed. The legislative body will have the power to call witnesses, compel documents and gather evidence for a final report expected in December, he said. Ford provided the details as he stood beside Finance Minister Vic Fedeli, who on Friday said the Progressive Conservatives had chosen to adopt accounting practices used by the auditor general and had -- through the work of an independent commission -- found greater deficits under the Liberals than had been reported. "Vic you helped shine the spotlight on the biggest government scandal in a generation," Ford said. Ford took no questions on his plans for the committee, which are in addition to the independent commission and a line-by-line audit of government spending that's expected to be finished in the coming weeks. "We're not going to let Kathleen Wynne and her cronies walk away from their $15-billion scandal because we can't let anything like this ever happen again," he said. Wynne, who is still a member of the legislature, said Ford is using the commission of inquiry and now the select committee to justify cuts he intends to make to public services. She stood by her record as premier and her government's reporting on its spending. "He's creating that context for cuts," she said. "But he's doing it in a particularly vicious, personal and, I think, misleading way." The Progressive Conservatives said the select committee will investigate Liberal accounting practices, decision making and policy objectives. The body will be made up of six government members and three NDP legislators. NDP Leader Andrea Horwath predicted the committee will be a "dog and pony show" and won't address urgent needs across the province. "There's nothing new in what's happening here except that the premier's obviously got the wrong priorities," she said. "If we had a select committee on hospitals that are crowded with hallway medicine we would be happy about that." Wilfrid Laurier University political science professor Barry Kay said the use of the committee, and the power it grants legislators, seems out of context with the importance of the issue. In the end, the Liberal government was held accountable by voters during the spring election when they were reduced to seven seats, he said. "With a select committee, he's just prepared to use what seem to be extreme measures for unnecessary matters," Kay said. "This is the way he seems to play politics...His style is that he views politics very personally." Kay said most governments find ways to blur the lines when it comes to finances. Even the Progressive Conservative's findings with the commission of inquiry appear exaggerated, he said. "There's so much gamesmanship on how to obfuscate debt that all provincial governments play," he said. "(Ford) clearly wants to be able to declare some crisis that justify him taking other actions that would be seen to be controversial." University of Toronto political science professor Nelson Wiseman said he's skeptical about the committee's work. "Committees are more or less given their marching orders before they start," he said. "It looks like a witch hunt." Wiseman also said the rhetoric Ford used to describe the situation suggests he doesn't know much about history. When former Tory premier Ernie Eves left office in 2003 Dalton McGuinty's new Liberal government said they uncovered a multibillion-deficit left behind by the Progressive Conservatives, he said, adding that governments make such findings all the time.